Upgrading your frame to the end of its progression requires special frame-specific progression tokens for boxes 8, 9 and 10 in each constraint. The Accord Merit Point components can be purchased from the Classified Tech vendors in each major POI at Power Level 3. Each vendor sells a different combination of components, so you may have to visit several towns to buy all the parts you need, depending on which towns are at which power levels. 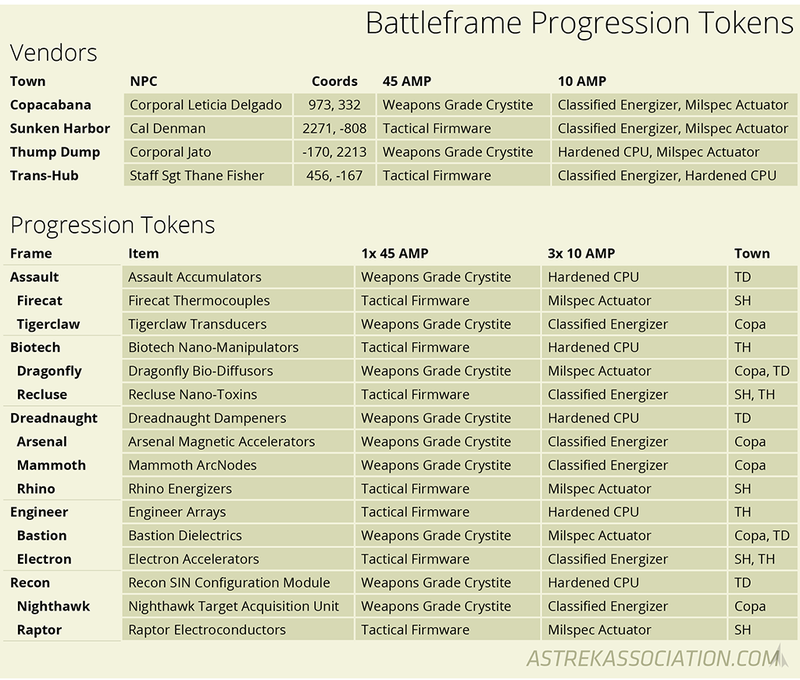 We’ve created a handy cheatsheet for reference when you’re looking to craft your frames’ progression tokens. The “Town” column refers to the town(s) where you can buy everything for that frame in one location, listed for convenience. Thanks for the guide, great job as usual! Just a thought…I think the AMP components can be done away with just as well as the DNA, crystite hybrids, etc have been. Just add them to the cost in the printer (call it Accord Influence?). No need to add these items to anyone’s inventory or go to another vendor someplace to get the “parts”. I wonder if this split in locations, type of components, and AMP costs were done due to companies maybe selling the AMP’s for cash, similar to crystite selling? It may have been; it’s also an incentive to keep the cities powered up to Level 3, since the vendors aren’t available otherwise. I don’t mind the incentive for the POI’s but Red5 gives out so many resonators that I’m not sure who actually spends AMP’s for them to power up the towers. I know I haven’t myself, but I’m only one tester.